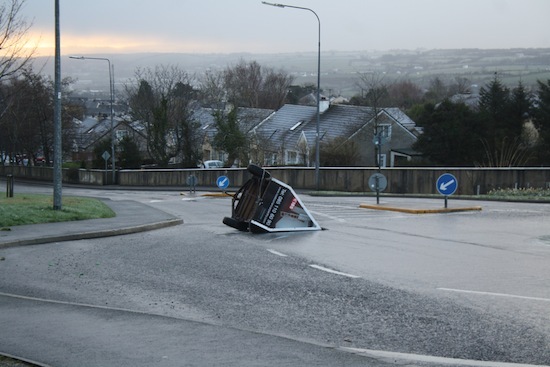 MOTORISTS had people had a ‘lucky’ escape today after vandals threw an advertising sign across the road in front of them. The incident happened on the Circular Road in Letterkenny shortly after 7am. The trailer-style contraption, pictured, was in the centre of the road close to a roundabout. Three youths were seen running away from the scene shortly afterwards, an eye-witness told donegaldaily.com. Gardai are investigating the incident and moved the trailer back to the side of the road. Meanwhile some parts of Co Donegal had a light dusting of snow and sleet overnight. Temperatures have dropped this weekend and Gardai are warning motorists to be careful on the roads, particularly in rural areas.